Need help again. I have had these for awhile but never could get information on what they are. They are miniature, maybe 2 1/2 inches tall. 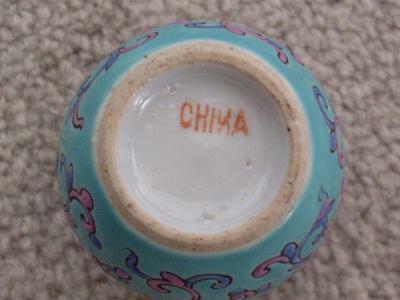 The china mark has a backward N. Could these be old? I have two of them they are both painted alike. Thanks for all your help. THANK YOU SO MUCH! DO YOU THINK I COULD TRY TO GET REPAINT OFF? OR IS THAT A STUPID QUESTION. You can't just remove the glaze as if it were paint. This is fired at perhaps 700-800 degrees. I would keep it as an example for the bottom and mark. Knowing how an old bottom looks like is more important than anything when identifying antique porcelain. The mark with the reversed N was probably an error and one of the earliest English marks in the late Qing dynasty. The bottom and foot rim of your jar look indeed as if they could be from that time. 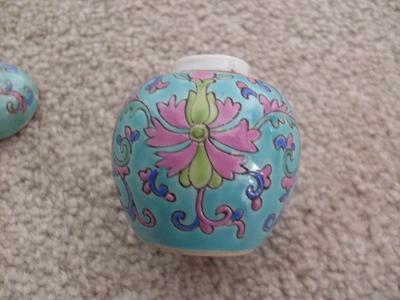 Unfortunately, the enamels and colors used are relatively modern. These were applied later in the 20th century. 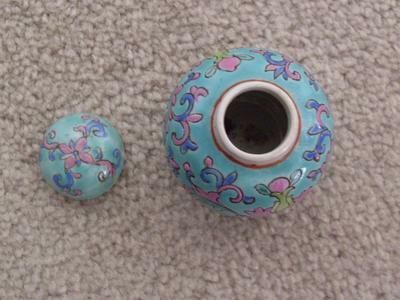 Thick enamels not corresponding to the age of the ceramic body is often found in items which were modified. Somebody likely repainted a plain item, or one with a simple decoration, in order to increase its perceived value. 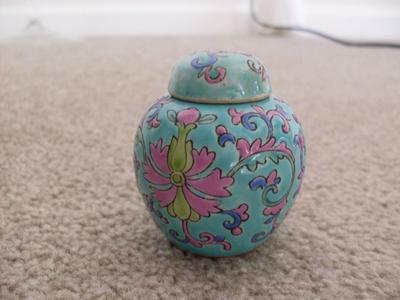 Unfortunately, collectors frequently don't consider such items to be antiques as the decoration is much "younger".